And just in time for the 2016 Decisive In/Out European Kibble Cup, where we face a face full of all kinds of football* with the result being that the winning team gets to stay in the European Union. Or something like that. 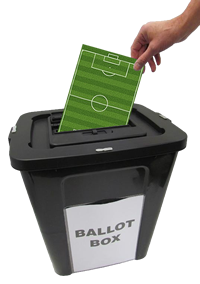 I don't really follow politics, but it seems that this year it's being decided by football. Mad!! They're all in it! England, Wales, Northern Ireland, Scotland! Well... no. Not Scotland. They're still grumpy about the results of the last referendum and so have refused to take part. Even so, it's MASSIVE games! I can't wait for the ultimate rematch - St. George vs. the Welsh Dragon. And of course, as we all know, you should never bet against the Dutch (because they didn't qualify). I'm so glad I've finally managed to get it up in your presence, so you can see how truly massive it really is! Enjoy my games, and don't forget to check out the competition!